Etihad Airways Abu Dhabi Grand Prix will be an unmissable event. It will also be the first race on Yas Marina Circuit. The first Formula 1 Etihad Airways Abu Dhabi Grand Prix will take place at the most beautiful, innovative and luxurious motorsport circuit ever built. Situated on Yas Island, just off the coast of Abu Dhabi, Yas Marina Circuit is a short drive from the capital city of the UAE and adjacent to the international airport. From November 2009 it will be the venue for the Abu Dhabi Grand Prix, the climax of the World Championship season. With easy access by land, air and sea, Yas Marina Circuit will offer spectators, sponsors, Formula 1 and other event partners an incomparable experience. Yas Marina Circuit is unique. It is the only circuit in the world where a 500 bedroom, 5-star hotel actually straddles the track! Yas Marina Hotel guests will have access to the Paddock via a purpose-built footbridge and their own entrance to the circuit. Every single grandstand seat on Yas Marina Circuit will be under cover – another world first. It is all a part of a strategy that puts people first, whether spectators, teams, media or corporate guests and partners. From the Yacht Club to the Media Centre, to the Team Buildings and the Marina, the Karting Centre, the Drag Racing Centre, the Driving School and the Business Park Centre, Yas Marina Circuit is built on quality, style and state-of-the-art technology. From November 2009, it will operate year-round as the world’s premier motorsport venue. 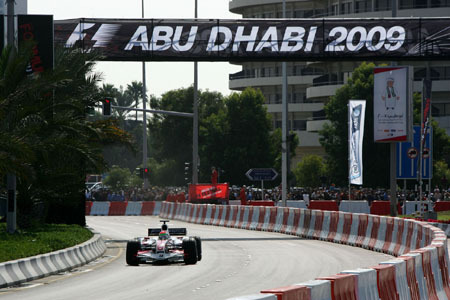 The 2009 Formula 1™ Etihad Airways Grand Prix be the first race ever held at Yas Marina Circuit and also the last race of the 2009 Formula 1™ season. Let’s hope that, as in the past two years, the championship will be decided in the final race…this time in Abu Dhabi. Formula 1™ is not only the world’s most glamorous sport, it the world’s largest annual sporting event. And now as far as the tickets go, they are on sale and if you buy them now you will be able to get 20% discount on every purchase of the ticket. so dont get late buy them now from here. ~ by Rud3Boy89 on April 1, 2009.